Now that the craft beer revolution is old news, a microbrewery can’t just make better-than-average beer to get noticed. 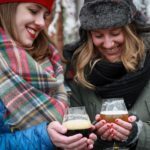 They have to do something really unique to get their name out there—and there seems to be no end to the weird things beer makers will do to get noticed. 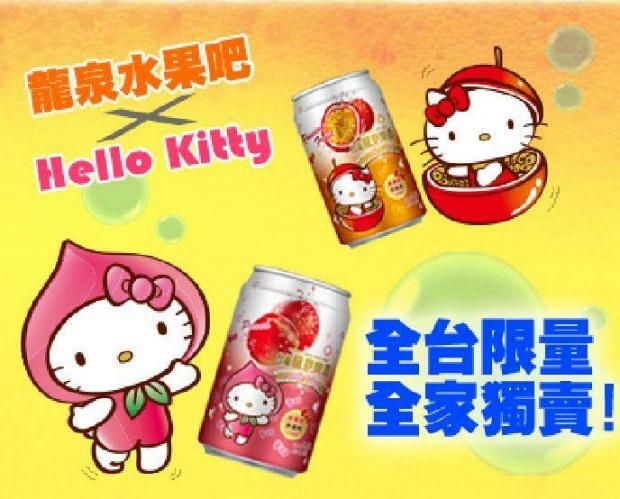 Here are some of the strangest beers on the market today. Here’s a title that seems to change every year or so. It started in 1999 with Sam Adams’ Utopia, which clocked in at 21 percent alcohol by volume. 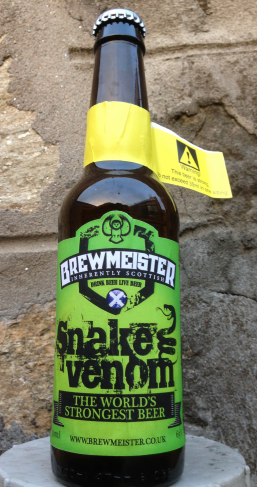 Last year, the title was topped by Brewmeister Brewery’s Armageddon, which contained 65 percent ABV, and just this week, Brewmeister upped their game by announcing their new Snake Venom, which contains 67.5 percent alcohol—making it an impressive 135 proof, which is stronger than many hard liquors. One bottle of Snake Venom will run you $80 (if you can even find it), and each bottle has a warning tag reminding you not to drink too much of the brew. If you’re looking for something with a nice blend of weirdness and a package certain to catch the eyes of your guests, try getting your hands on Brewdog’s “The End of History,” a 50 percent ABV beer released in 2010 that sold for the absurd price of $765. But you weren’t just paying for potency at that price: “The End of History” was a special, limited-edition Belgian blond ale. 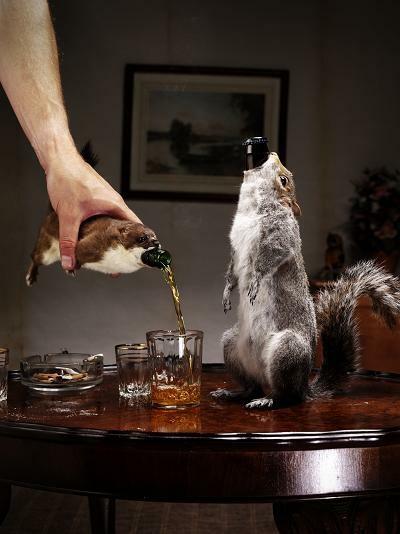 Only 12 bottles were made, and they were all contained within the taxidermied body of a squirrel or weasel. The beer was recreated as a joint experiment between archaeologists from the University of Chicago and brewers from the Great Lakes Brewing Company. To keep things as authentic as possible, they used recreations of ancient tools and ceramic fermentation pots, malted the barley on a roof, and hired a baker to create a yeast source similar to the kind used in ancient times. They even refrained from using modern cleaning methods to clear natural bacteria that grow in the pots. So how did the experiment go? 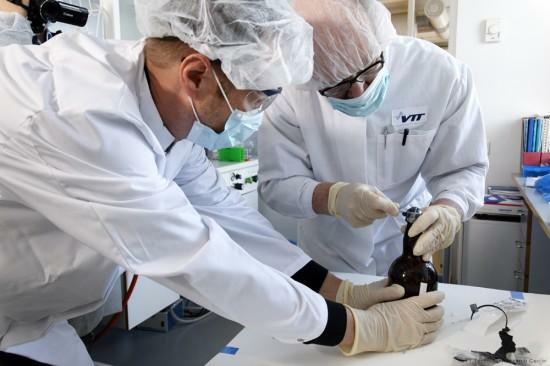 Well, researchers think they recreated the beer just right, but they found it was far too sour for modern day tastes and almost tasted more like vinegar than our modern beers. The brewer hopes to give it another try only with some sweet additions from the time period, like dates and honey to get rid of some of the overwhelming sour flavor. If he’s successful, you might just get to try a 5000 year old beer recipe for yourself one day courtesy of the Great Lakes Brewing Company. While you might not be able to get your hands on one of those five bottles of 200 year old beer, you might get to taste a recreation of the brew, since one of the salvagers happens to be a microbrewery owner who wants to work with scientists to resurrect the formula. Presumably the new version from Stallhagen Brewery won’t taste quite so old, but it’s hard to say if it will still taste acidic and burnt or if those flavor notes came from age as well. Perhaps you don’t care as much about old beer recipes as you do about old ingredients. In that case, you won’t want to miss some of the brews from Fossil Fuels Brewing Company, who started brewing pale ale and German wheat beer with a strain of yeast that is over 45 million years old. The brewery is owned by Raul Cano, who also just happens to be a scientist at the California Polytechnic State University. He uncovered the dormant yeast strain from a Lebanese weevil that was covered in ancient Burmese amber since the Eocene Period. Interestingly, while modern yeasts can consume almost any kind of sugar, this ancient variety can only grow on a narrow type of carbohydrates, which creates a unique flavor in beer. So how does this Eocene Epoch of beers taste? The Oakland Tribune beer critic, William Brand, noted that it has a “weird spiciness at the finish,” and over all it has received positive reviews from critics and fans alike. 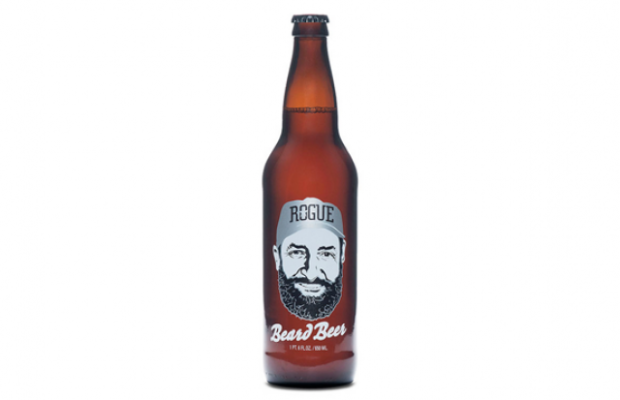 Plenty of brewers claim to put a little bit of themselves in their bottles, but only Rogue Ale’s The Beard Beer (which we covered back in September) takes that idea so literally. As the name implies, the beer is created thanks to a beard—specifically, the beard of the company’s master brewer, John Maier. The company was looking for a new source of yeast when someone joked Maier’s beard might be a perfect place to grow yeast. Sure enough, the beard can grow yeast—and quite great yeast, in fact, created from the over 15,000 brews Maier happened to be present for. Want a beer with ingredients that are out of this world, literally? Then you actually have two options. 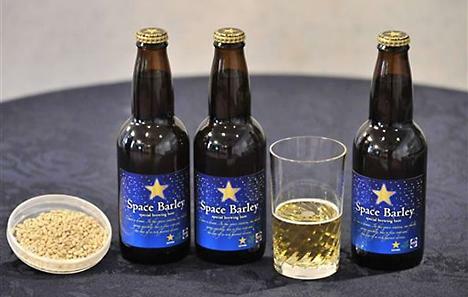 Sapporo Space Barley features barley that was on the International Space Station. 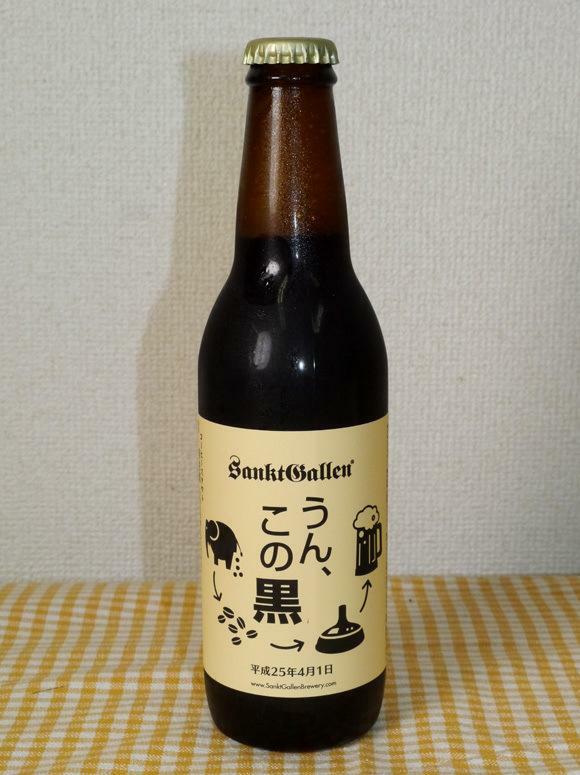 The 2009 limited edition beer was released in 250 six packs that sold for around $100 each. Proceeds were used to support science education. Alternatively, Dogfish Head Brewery’s Celest-jewel-ale contains dust from lunar meteorites. If you’re wondering why the company would put crushed space rocks in your beer, it’s not just to be fancy. As it turns out, since the meteorites are mostly minerals and salts, the dust aids the fermentation process. Unfortunately for those interested, you can only get this space beer from the company’s Rehoboth Beach pub. But on the upside, if you do make it out there, it’s served in a koozie made from the same material as an astronaut’s space suit, so at least they make an effort to go for a theme. Oh, and you’d better hurry if you want to try some, as it was only made in a limited edition batch at the beginning of October and once it’s gone, it’s gone for good—just like a beautiful shooting star of beer. Actually, the beer itself hasn’t been digested yet. It’s really only the coffee beans that were used in a special coffee known as Black Ivory. Rather than using civets to digest the coffee beans before they are processed, this coffee uses elephants. Then, once the elephants poop out the beans, it’s made into coffee and at that point, the coffee is brewed into Sankt Gallen’s Un, Kono Kuro. Reviewers say it was actually quite delicious, with a strong, bitter taste followed by a wave of sweetness and a mellow body. Mamma Mia! Pizza Beer: Who says you need to chew your pizza? This brew actually is made with a whole margarita pizza in the mash and plenty of pizza spices to enhance the flavor. Maple Bacon Coffee Porter: The best part of waking up is The Funky Buddha’s maple bacon coffee beer in your cup. Voodoo Doughnut Chocolate Peanut Butter Banana Ale: Can’t decide between a chocolate, peanut butter, banana donut and a nice ale? 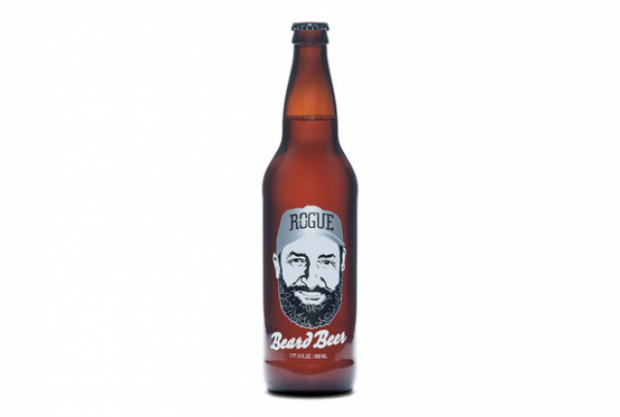 Well, you’re probably already drunk, but at least you’re covered with this Rogue Ale brew. Rocky Mountain Oyster Stout: Yes, this Wynkoop Brewing Company specialty really contains bull testicles—three per barrel, to be precise. Coconut Curry Hefeweizen: New Belgium Brewery’s innovative brew combines the sweetness of coconut, the spicy flavor of curry and a hint of banana. Would you guys ever drink any of these? Even better, have any of you ever tried any of these?